This method is used to replate edge contacts by selective swab plating. Flow solder over the entire surface of each contaminated contact. Swab the contaminated area with solder stripping solution until all solder has been removed. Option 1: Apply high temperature tape then solder a wire to the edge of the contacts needing plating. Option 2: Apply high temperature tape then apply conductive paint to the contacts that need plating. Sample plating anodes shown with fabric wrapping. Swab all the contacts by brushing the surface with the saturated plating probe. This method is used to replate edge contacts by selective swab plating. Edge contacts may require replating if they become contaminated with solder or are scratched during handling. Other applications may arise when the plating on the edge contacts does not meet the minimum thickness specification or if the specification changes. This electroplating process uses a DC power supply. One lead is connected to the connector edge contacts that need plating. A second lead is connected to the plating probe. The plating probe has an anode fastened to the tip. The anode has absorbent wrapping. The anode is dipped into high-speed proprietary plating solutions. 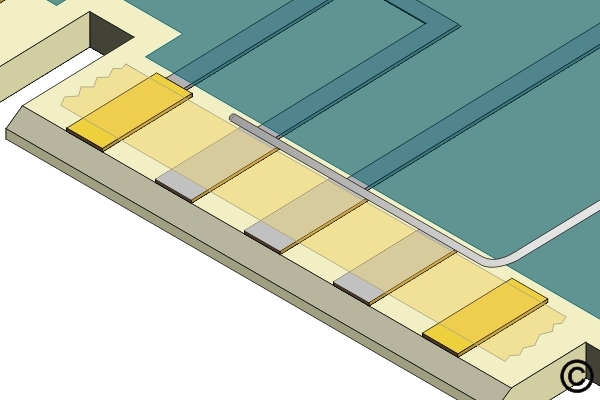 When the saturated anode is swabbed across the circuit board connector edge contacts, the metal contained in the solution is plated wherever electrical contact is made. Prior to replating any solder contamination must be removed. This method can be used to replate any metal surface including connector edge contacts, but it is essential that the surface to be plated is free of deep scratches, nicks, pin holes or other defects. If the edge contacts need to be replaced see appropriate procedure. A thorough review of this method should be made before repairs are attempted. Technicians should become familiar with the tools included and should practice on scrap circuit boards. To expect the best results a clean work environment is essential. A smooth work surface and good lighting are recommended. Safety glasses and safety gloves should always be worn when handling hazardous chemicals. The work area should be adequately ventilated. It is particularly important to have adequate ventilation when using gold solution, since gold solution contains a very small percentage of free cyanide. If ventilation is not adequate, use a fan to move fumes away from the operator. 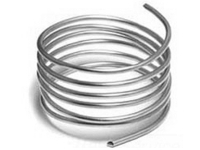 It is essential to follow the manufacturer's instruction supplied with the plating equipment. 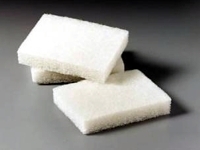 Light duty abrasive scrubbing pads to remove contamination and blend surfaces. Used to create an electrical connection across conductive surfaces during plating. 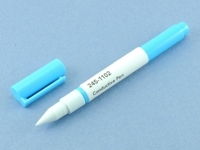 Pen dispenser for creating conductive silver traces. 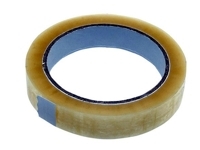 This tape is specifically designed to test plating adhesion. Figure 1: Connector Edge Plating System. Figure 2: Flow solder over the entire surface of each contaminated contact. Figure 3: Swab the contaminated area with solder stripping solution until all solder has been removed. Figure 4: Rinse the area with water. A water/air sprayer provides a full water flush. Figure 5: Apply Kapton tape then solder a wire to the edge of the contacts needing plating. Figure 6: Apply Kapton tape then apply conductive paint to the contacts that need plating. Figure 7: Sample plating anodes shown with fabric wrapping. Figure 8: Swab all the contacts by brushing the surface with the saturated plating probe. Safety glasses and safety gloves should always be worn when handling hazardous chemicals. Do not work within a small enclosed room without supplemental ventilation. If ventilation is not adequate, use a fan to move fumes away from the operator. Apply plating tape to the circuit board surface surrounding the area to be reworked. The plating tape will protect adjacent components and the circuit board surface from unwanted exposure to stripping and plating solutions. Place the circuit board on the board support so that the leading edge overhangs the rinse tray. Mildly buff the contacts using abrasive pad. Mild buffing will prepare the surface for plating and remove any remaining solder contamination. Thoroughly rinse with water to remove any residue. Buff the contacts using an abrasive pad. Buff the contacts until all defective or poor plating is removed. Burnish small scratches. Use the tip of the Burnisher to work the copper material into the scratch and smooth out the area. Finish by mildly buffing the area to remove any minor burnishing marks. If there are large scratches the contact may need replacement. See Procedure Number 4.6.1 or 4.6.2. Thoroughly rinse the entire area with water to remove any residue. 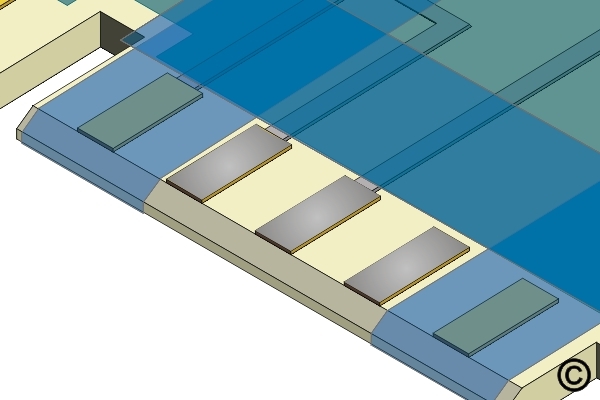 A conductive bus must be made to all the contacts that need plating. There are 4 basic connection options. Making a reliable bus connection is the most important step in plating. All sorts of problems will be eliminated by taking the time to make a reliable bus connection. When finished, this method will leave a small unplated line along the inner tip of each contact. Apply High Temperature Tape to all the contacts to be plated. The High Temperature Tape should cover the entire contact except for a small line along the inboard edge. The High Temperature Tape will prevent further solder contamination. Apply High Temperature Tape tape to all the contacts to be plated. The High Temperature Tape should cover the entire contact except for a small line along the inboard edge. The High Temperature Tape will prevent the conductive paint from contaminating the contact surface. 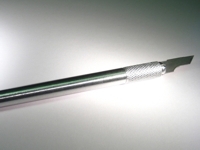 Each contact needing plating can be individually probed using the plating probe. 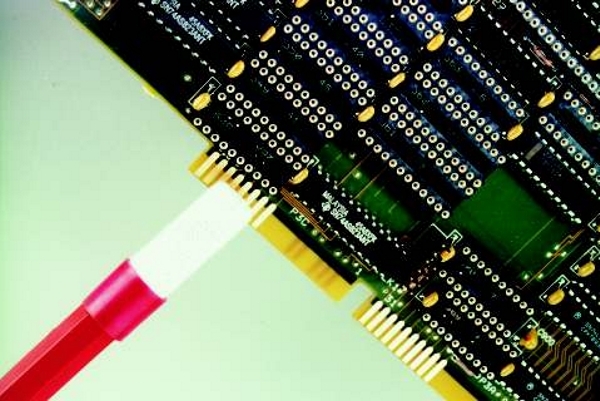 Touch the tip of the plating probe to the inboard edge of each contact or to the connecting circuit as each solution is applied during the plating process. Make a mechanical connection to each contact using a pin fixture. The pin fixture has spring loaded contact pins on centers matching the spacing of the edge contacts to be plated. The contact pins make direct mechanical connection to the inboard tip of each contact, the connecting circuit trace or a connecting plated through hole. Make the cathode connection (-) to the circuit board by using a plating probe or probe clip. Connect the probe clip directly to the wire bus connection or to the edge where conductive paint has been applied. The cable should be connected to the (-) or black jack on the power supply. Set the output current on the power supply to setting recommended by the equipment manufacturer. Refer to Table 1 for general voltage/time settings. 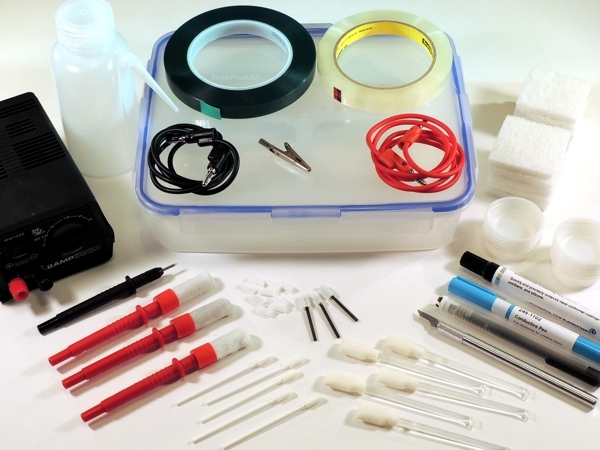 Dip the plating probe into the Electroclean plating solution. Wait a few seconds for the solution to saturate the absorbent wrapping. 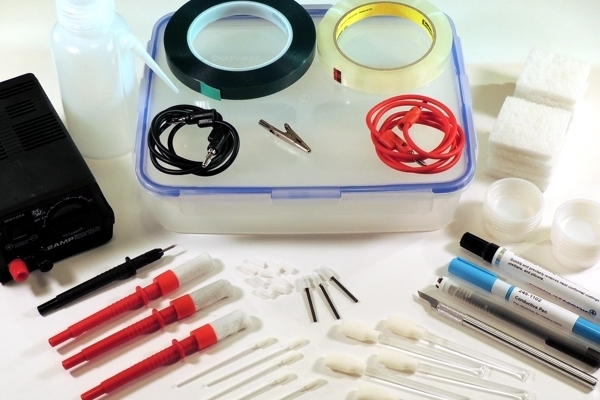 Swab the entire surface to be plated by brushing the surface with the saturated plating probe. The plating probe should be moved back and forth briskly to prevent burning and to provide even coverage. (See Figure 8) Swab the area for the time recommended by the equipment manufacturer. Refer to Table 1 for general voltage/time settings. Thoroughly rinse the entire area with water. Any burning or darkening of the contacts may be removed with an abrasive pad. Saturate the abrasive pad and the PC board surface with water and lightly buff the contacts until all evidence of the burning or discoloring is removed. Rinse the entire area with water. Do not allow the rework area to dry out between steps. The water coating prevents oxidation. Connect the nickel plating probe to the power supply (+) or red jack. Dip the plating probe into the nickel plating solution. Wait a few seconds for the solution to saturate the absorbent wrapping. Swab the entire surface to be plated by brushing the surface with the saturated plating probe. The plating probe should be moved back and forth briskly to prevent burning and to provide even coverage. Swab the area for the time recommended by the equipment manufacturer. Before rinsing, lightly buff the contacts with an abrasive pad. Refer to Table 1 for general voltage/time settings. Thoroughly rinse the entire area with water. Connect the gold plating probe to the power supply (+) or red jack. 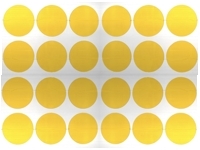 Dip the plating probe into the gold plating solution. Wait a few seconds for the solution to saturate the absorbent wrapping. Swab the entire surface to be plated by brushing the surface with the saturated plating probe. The plating probe should be moved back and forth briskly to prevent burning and to provide even coverage. Swab the area for the time recommended by the equipment manufacturer. Refer to Table 1 for general voltage/time settings. Remove and discard all plating tape and thoroughly rinse the area with water. Dry the area using a water/air sprayer or wipes. 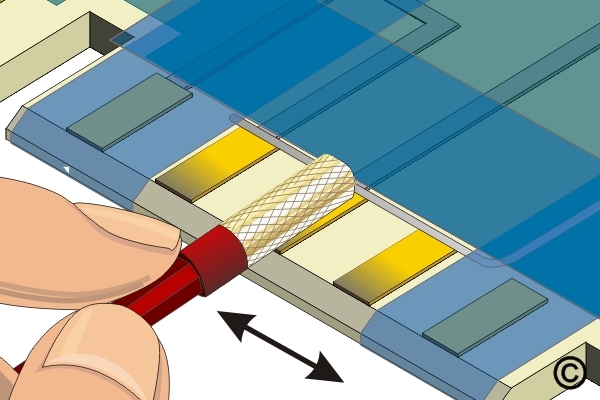 Remove the wire or conductive paint used to bus the contacts. 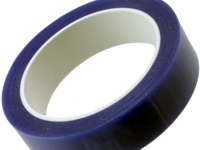 Apply High Temperature Tape tape to protect the contacts from further contamination while removing the bus connection. 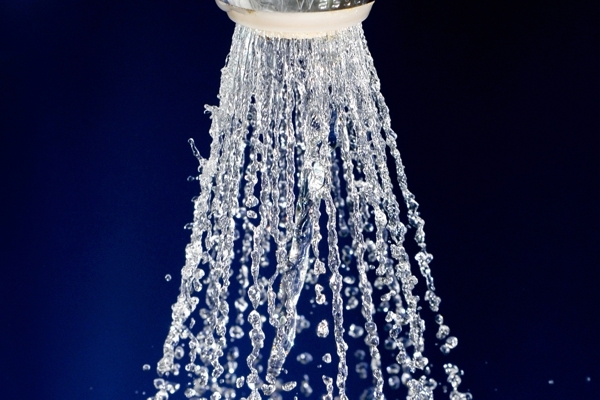 Thoroughly rinse the entire area with deionized water or rinse the circuit board in an aqueous water cleaning system. Surface Area is the total area being plated during each swab plating operation. Voltage and Time setting shown in Table 1 are for a minimum of .000100" Nickel (.00254 mm) and .000050" (.00127 mm) Gold. Settings are a guide. For precise thickness requirements the final thickness should be verified with proper measuring equipment. The rework area should be checked by measuring the thickness of the nickel and gold to make sure they meet the minimum thickness requirement. The plating bond may also be checked by doing a peel test using peel testing tape. Visually examine the rework area for color and luster.